"The Moonbase" / "The Moonbase" / "The Moonbase" / "The Moonbase"
Whatever flaws it may have, and it’s far from perfect, “The Moonbase” has more than enough going for it to earn a place as one of the must-see serials of the Second Doctor era. For one thing, with its two missing episodes newly reconstructed via animation (and newly out on DVD), it’s currently the earliest complete serial featuring Patrick Troughton as the Doctor, whose three seasons were particularly hard-hit by the BBC’s old policy of erasing its archived videotapes. So one of its chief pleasures is watching Troughton, who’s easily in the top three actors to play the Doctor, while he’s still settling on exactly how he’ll play the role. It’s also a thriller that makes up in fast-paced and tension-filled atmosphere what it loses in some implausible contrivances and sloppy staging. 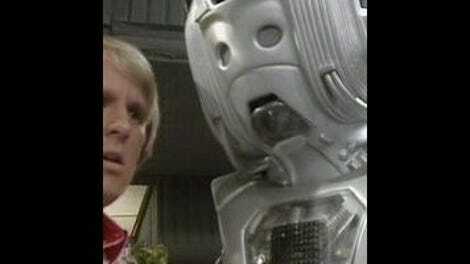 And, of course, it firmly established the Cybermen as the Doctor’s newest, most potent recurring threat. The other new face, of course, was the Doctor himself. Patrick Troughton had taken over the job only a few months earlier and was, I think, still settling in. Troughton always played the Second Doctor as a bit of a clown, but before this point he had a tendency to lay on the wackiness a bit thickly. Here, though, he starts to find a darker, more serious side to the character, helped especially by a scene in the second episode that’s become one of the touchstones of this era—the “they must be fought” speech. I’ll get back to that later. The opening scene, as usual for this era, starts in the middle of the previous week’s cliffhanger, the details of which don’t really matter here except that the TARDIS has been suddenly pulled off course while the Doctor is trying to pilot it to Mars. The ship lands instead on the Moon, to the Doctor’s disappointment but Ben, Polly, and Jamie’s elation—which is understandable, since it’s two years before Neil Armstrong’s arrival and they get to go jump around in spacesuits out there. Nearby, there’s a manned station on the surface, and more ominously, a flying saucer parked just out of their view. The Doctor reluctantly agrees to let them explore the lunar surface, but not before arguing that they should leave “while we can.” It’s a strange and ominous line when you think about it, implying that he thinks trouble will find them if they stick around too long. It’s almost a metafictional comment—if they stay on the moon, that means this week’s story will be set on the moon, and the Doctor had his heart set on Mars. At any rate, after Jamie stupidly knocks himself out, they make their way into the moonbase, which, much like the Antarctic base in “Tenth Planet,” is an isolated science station of strategic importance but limited defense, a sitting duck waiting to be captured by the enemies of humanity—certainly not the last time Doctor Who would rely on that setting, either. One thing that’s very different about this isolated base compared to the one in “The Tenth Planet” is the conspicuous lack of a military presence. Instead of the gruff, hostile and homicidally paranoid General Cutler, Hobson occasionally talks tough but seems to have no instinct for suspicion or security at all, despite being in charge of a device powerful enough to end all life on Earth. Where Cutler winds up threatening to have the TARDIS crew shot, Hobson merely tells them to “get off the moon” even though he suspects that they have something to do with the illness that’s killed some of his men. It doesn’t really make that much sense, but if there’s one thing this story is good at, it’s moving quickly enough that you don’t really question things like that until later. That brisk pace and tension-filled atmosphere is especially effective during the cliffhanger to the second episode, when the Doctor realizes in horror that the Cybermen have been hiding in the very room he’s standing in. Thanks to Troughton selling the scene almost singlehandedly, it’s one of the best moments of “The Moonbase,” but could easily have come across as ridiculous considering that, well, did nobody really notice that an eight-foot-tall metal robot was hiding under a blanket with its feet sticking out? DOCTOR: Evil is what I meant. There are some corners of the universe which have bred the most terrible things. Things which act against everything that we believe in. They must be fought. This speech is important for two reasons: First, it shows that the Doctor has found the resolve to openly declare that he is not just a wanderer who happens to get into trouble a lot, but someone who takes steps to do what’s right. True, this has been increasingly a part of the Doctor’s character since the beginning, but it’s hadn’t yet been stated quite so decisively as here. Which is not to say the Doctor actually takes decisive action right away, in part because that’s just not the Second Doctor’s style—he’s not a grandstander like David Tennant or Matt Smith would be, and it’s worth noting that Troughton’s delivery of “they must be fought” isn’t a call to arms so much as a rather grim acknowledgement that he’s got some dirty work to do. The Second Doctor is not an overt heroic figure, he’s a quiet schemer who lurks in the background, silently watching for his enemies to present a weakness and waiting for his chance. He’s like a mouse who’s taken up arms against an army of cats. He’s also unworried about appearing to be a fool, and it’s clear that this is both a strategy on his part to get people to underestimate him, and more than a little actual foolishness: One of the first things he does after boldly declaring that he’s here to fight evil is to sneak around the control room stealing other people’s shoes. It’s his companions who take the most bold risks here—Ben and, even more so, Polly both act on their own initiative against the Cybermen. It’s a welcome change from Polly’s uselessness and patronizing treatment in earlier serials—sure, she’s still expected to make coffee for the menfolk here, but she shows her worth in devising the cocktail of solvents that form their main weapon, and refuses to let Ben sideline her with a chauvinistic comment about men’s work. The second thing that the Doctor’s “they must be fought” line does, as a piece of rhetoric, is bolster the credentials of the Cybermen as the new Big Bads of Doctor Who. Because if the Doctor is talking about them in terms like this, surely they must be something to fear, right? 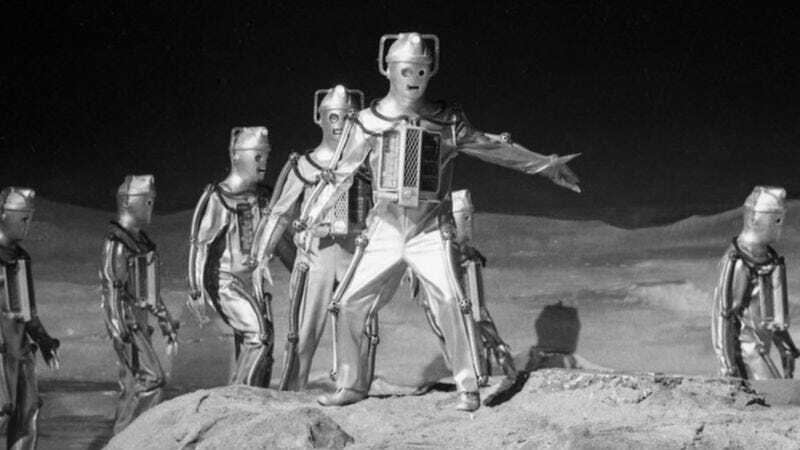 That is, more than anything, the point of “The Moonbase.” Even though “Tenth Planet” was made only a few months earlier, the Cybermen here have undergone a thorough redesign, streamlining their look and turning them more fully into robots rather than the bizarre space vampires from Mondas we saw earlier. Their voices are no longer bizarrely sing-songy but a flat, affectless computerized rasp. Their hands are no longer human but three-fingered metal claws. (There was apparently a scene left unfilmed that actually explained this change, stating that the ones seen here were an offshoot that left Mondas before it was destroyed and moved to the planet Telos instead, where they underwent a further evolution. Telos would later pop up as the setting for their next appearance, “Tomb Of The Cybermen,” so the concept lingered on in the background.) This is partly a good thing, since there was much about the first design that just didn’t work, but I can’t help but feel it also loses something of the essential existential horror of the original half-human monsters. It was probably necessary to simplify them if the Cybermen were going to be used again and again, but it also made it all too easy for future installments to lose sight of the idea that the Cybermen were originally envisioned as something like Lovecraftian Borg—not just bad robots but ex-humans whose alterations were meant to make your skin crawl. • A bit of scheduling news: I’m taking a short break from writing these Doctor Who Classic reviews in order to concentrate on another project, but I’ll be back at the end of May. In the meantime, if you’re in the Minneapolis area, come join me at the Doctor Who convention CONsole Room, May 16-18, where I’m honored to be one of the guest writers. Sophie Aldred (Seventh Doctor companion Ace) and Deborah Watling (Second Doctor companion Victoria) are the celebrity guests. Though pre-registration for the con is now closed, you can still buy tickets at the door. More details at http://console-room.mpls.cx/. • How do the Cybermen recognize the Doctor on sight, even though he’s regenerated and these particular Cybermen never met the Hartnell Doctor anyway? It’s a sloppy bit of writing that creates a problem while trying to solve a more immediate one, namely making sure that the star of the show actually gets a scene facing off directly against his foes. The only explanation, I think, is that there’s an unfilmed Cyberman encounter that takes place sometime betweeen “The Tenth Planet” and this serial—which is a little tricky since Ben and Polly would have been there too, and (of course) they don’t mention anything about it now. • June 14: The early Seventh Doctor serial “Paradise Towers,” arguably the first sign that the show had found its way again after the whole Trial debacle.